Mandy Fish: Quit Effing With Me, Anthropologie. I just couldn't be alone with this. 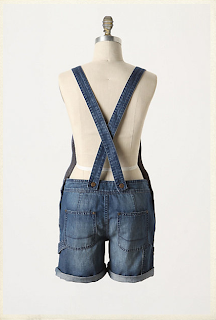 Backless overall shorts are so moderne. Well...I know what I want for Father's Day. Joshua: It would make for a nice photoblog. Also, have you noticed that the new design for the pop-up comments window won't allow for subscribing to comments? I noticed that, Joshua. Blogger is driving me nuts. Oh, and the shorts? No one looks good in overall, backless shorts. Whoever would sell these to you is not your friend. Those would look foxy with your V day CFM heels. 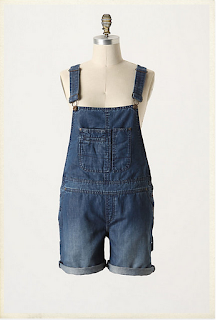 @Nice Peace: If I were to wear the Louboutins with the overall shorts I think the world would implode. It's a thong amphitheatre. Dear Lord, we're doomed. I KNEW I shouldn't have given away all of my bib overalls. Damn it. Oooh, those are SUPER cute. If I had a spare $TooMuch, I'd be all over those. The last time I put on a pair of those, I ran screaming from my bathroom, upon catching a glimpse of myself in the mirror. @Susan in the Boonies: I owned several pairs. Oh. The. Horror. years and years ago (circa 1986 when i was sixteen) i had a pair of striped esprit overalls. i wore them with black converse high tops. gulp. i stopped wearing them when one of my co-workers sang COME ON EILEEN (by dexys midnight runner) every time he saw me. argh. Back in the day, waaaaay back, I had a pair of overall shorts. Loved them to death. No, really, that's all I have to say. @One Bad Pixie: I have worn them in the past. I'm not proud. @Drollgirl: Come on Eileen! Laugh! I owned overall shorts in several colors. Egad. @Shirley: I did too but that doesn't mean we can love them again. Like many of my exes...I can never go back.